I arranged a van for past Sunday, yesterday, found my dad and Bart so kind to help me drag this monster into the van and bring it back home. With good intentions and a happy feeling we drove towards Avelgem, a 250 KM drive for us, one way. The journey went fine, some traffic jams but not anything major. We had a warm welcome including a nice cup of coffee. Some chitchat which was very interesting btw. Lovely house and really interesting people! So I had to tell Peter I wasn’t gonna bring it home. Too bad as it’s a fantastic machine and would’ve loved to have been able to add it to my stable. 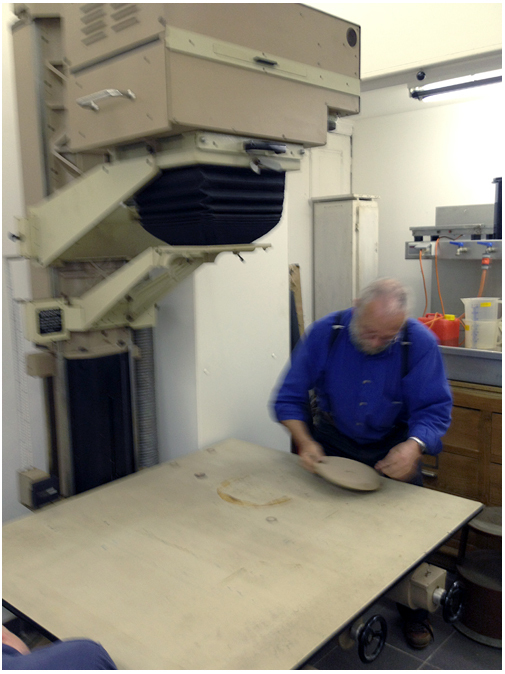 I could enlarge my 10×10″ collodion negatives with that thing which was the plan. Anyway, I’m gonna start looking for a new place to live which houses a bigger atelier than our current one, with ceilings at at least 3 meters 😉 Haha, the dreaming is a nice journey on its own! It’s a crappy iPhone photo, unsharp as I was trembling too much haha! This entry was posted on July 23, 2012 by Contrastique. It was filed under Atelier Contrastique, Miscellaneous and was tagged with 10x10, devere, enlarger, impossible. Si cette machine ne trouve pas preneur, je veux bien être candidat. Does he still have the enlarger?